We are building the UK's largest online farming market place. Browse our online marketplace for quality used machinery for sale from independent dealers and private sellers. Reach thousands of farmers and farm managers. Get real-time feedback on your adverts. Are you a private seller? Upload up to 20 pictures. Your recent list of all the searches you have performed while on LammaXchange. Login or Register to save your searches and view them on all your devices. We will also automatically notify you when new listings show up for your searches. Are you a trade seller? Login or register to save your searches and view them on all your devices and you will also automatically notify you when new listings show up for this search. 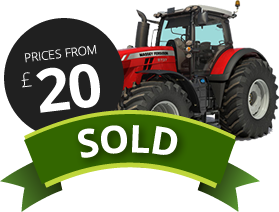 Get the latest farm machinery ads from tractors, mowers, tankers, loaders to combines.